Evanston resident Verzell James holds up sign in protest at City Council meeting Monday. 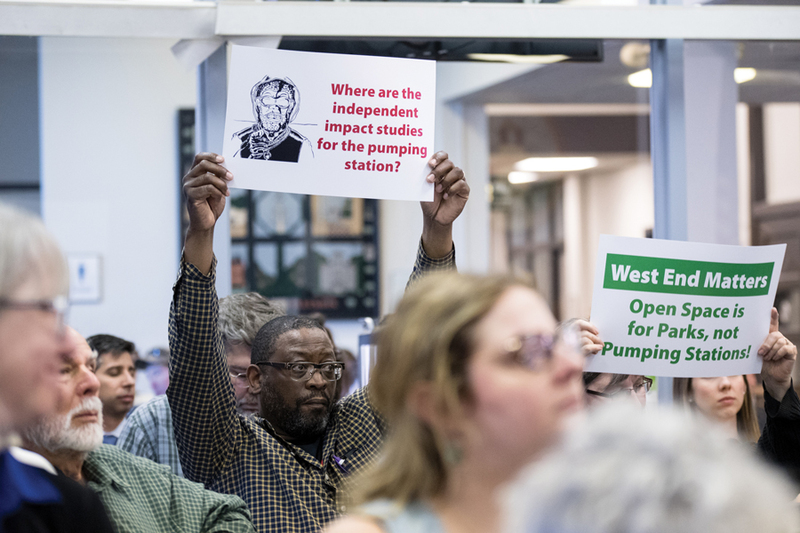 Fifth Ward residents expressed frustration that the city received the award as it planned to install a water pumping station in their neighborhood. Evanston was recertified as a 4-STAR community in the STAR Community Rating System, a scale evaluating the social and environmental sustainability of local governments, city manager Wally Bobkiewicz said at a City Council meeting Monday. STAR Communities — the nonprofit organization that administers the rating system — gave Evanston four out of five stars. The city first received the 4-STAR rating in 2014 and is the first U.S. city to be recertified after the organization redesigned its rating system this year. Catherine Hurley, the organization’s board secretary, said the new version holds local communities to a higher standard than the original system. She said she was with STAR four years ago when Evanston received its first award. “Evanston being recognized again as a 4-STAR community and recognized for national excellence in community sustainability is really a wonderful accomplishment,” Hurley said at council. The organization allocates points according to seven categories: the built environment, climate and energy, economy and jobs, education, arts and community, health and safety, natural systems, and innovation and process, according to the group’s website. Evanston gained points for residents’ access to off-road trails, porous pavement and energy efficiency, among other areas, according to a report from STAR. Within the eight categories, Evanston scored the lowest percentage in equity and empowerment, garnering less than 50 percent of the possible points. Within that category, the city scored lowest in human services. At the Monday meeting, some residents pushed back against the award in reaction to a planned pumping station in the 5th Ward, arguing the city failed to consider the lives of the people who would live closest to it. In early February, the city announced plans to build a water pumping station at 2525 Church St. Since then, residents have attempted to halt the construction, saying residents were not given sufficient warning or opportunities for input. Members of the West End Area Pumping Station Impact Task Force attended council to express frustration over the 4-STAR rating, holding up signs saying, “4 star hypocrisy” and “Where are the independent impact studies for the pumping station?” Task force member Verzell James said they wanted to show that Evanston is not worthy of the award. In response to the backlash, Bobkiewicz said people are entitled to their own opinions, but the STAR report was comprehensive in showing how Evanston is connected to the community. James said the mostly silent protest showed council the task force would not ease its pressure to stop the pumping stations development.